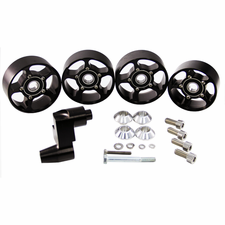 This Billet Aluminum Auxiliary Snub Idler and 4pc Pulley Kit upgrade will give your car increased belt tension for reduced belt slip. Designed to provide the most tension and belt wrap around the supercharger pulley to eliminate slip. Idler pulleys are hardcoat anodized to prevent premature wear from the belt and tighter tolerance on the bearing. Includes a 90mm pulley and 3 100mm pulleys. 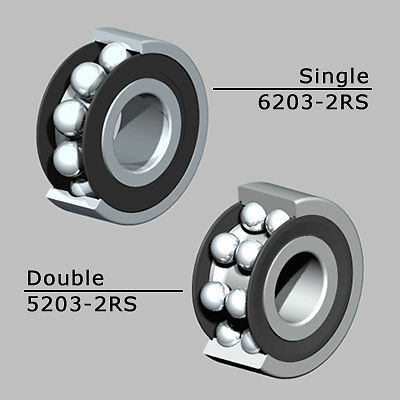 Now available in double row bearing for increased angular load and durability. Quality Construction: Machined from Billet Aluminum for strength and durability as well as great looks and also uses high quality double sealed bearings. Pulley is hardcoat anodized for a long life. No one else can Stack up to the bold clean styling of our aftermarket Billet / Stainless Steel Dress Ups, Street / Strip / Racing Suspension and Performance Parts for your American Muscle Car! Installs in 30 minutes or less. Fits these Vehicles: 2003 2004 Cobra Terminator 4.6L Supercharged Mustang Roush & Saleen Vehicles. Made in the USA! This Billet Aluminum Auxiliary Snub Idler and 4pc Pulley Kit upgrade will give your car increased belt tension for reduced belt slip. Designed to provide the most tension and belt wrap around the supercharger pulley to eliminate slip. Idler pulleys are hardcoat anodized to prevent premature wear from the belt and tighter tolerance on the bearing. Includes a 90mm pulley and 3 100mm pulleys. 2003 2004 Cobra Terminator 4.6L Supercharged Mustang Roush & Saleen Vehicles.